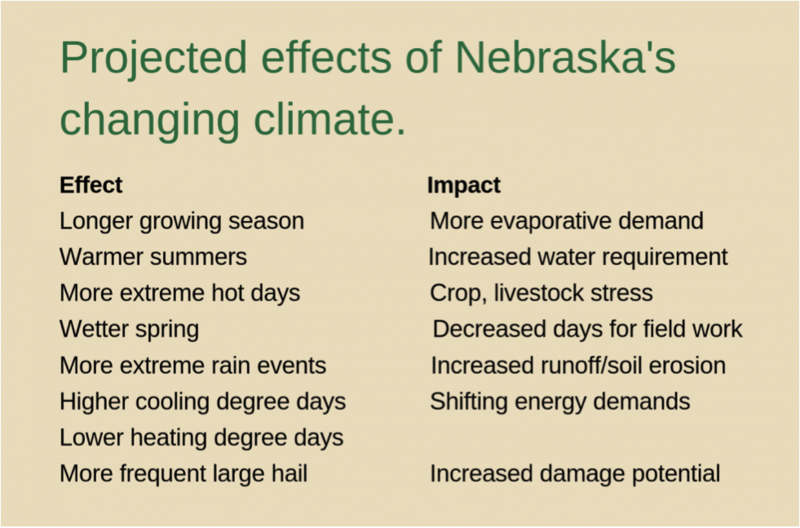 This slide from the 4th National Climate Assessment presented by Dr. Shulski, highlights Nebraska’s changing climate and the challenges farmers will face in upcoming years. As the water recedes, at least for now, Nebraskans face an unknown climatic future. While the future may be uncertain, there is no doubt the recent events have sent a ripple across the Great Plains. Farmers, such as those in our family, now must address how to conduct their farm business differently to adapt to the rapidly changing weather patterns. The good news is that Nebraska farmers have a heightened sense of awareness about the possible risks they face moving forward. At the same time the Bomb Cyclone hit, U.S. farmers were facing their 5th year in a row of making less money than it cost to produce their product. Today, we are in the worst economic downtown for farmers since the Farm Crisis in the 1980s, with bankruptcies and farmer suicides both on the rise in alarming numbers and one more generation of farmers migrating off of the land. This pattern puts our food security and the future of the independent family farm at risk, which opens the door for further corporate consolidation of the food production industry. That trend puts our climate future in extreme and irreversible danger as it is well known that the current agricultural system is inefficient and has become one of the leading climate culprits. This is not something as a farmer I take lightly or am proud of, but agriculture is also the solution. So now we are faced with a very important crossroads in our history and this just may be our last chance to get things turned around. What is the future for farmers in Nebraska? The good news is that farmers are a resilient bunch and over time have been a species of adaptation. Very small, inexpensive changes to the farming operation can keep farmers on the land and also have an enormous impact to our land, air, and water. Farmers now have an opportunity to serve on the front lines in the fight against rising greenhouse gas emissions and for the preservation of healthy soil, clean air and water. How can farmers lead? Soil health and regenerative farming practices have been used by farming stewards for thousands of years, tracing back to farming’s indigenous roots. However, the current degenerative model that is aggressively being placed into Nebraska has severely degraded the land to the point that now the Food and Agricultural Organization predicts we only have 60 harvests left due to over-tillage and excess chemical exposure. For years, we have been told that technology and genetic modification (which is different than natural plant breeding) would help us “feed the world” and become more resilient to extremes, but it appears the chemical and seed company’s claims were untrue as we have experienced exactly the opposite. As more farmers are becoming aware of these untruths, more of us are breaking the relationship with destructive companies and adopting the regenerative principles practiced by our ancestors. Regenerative practices include no-tillage, cover cropping, multi-crop rotations (in addition to corn and soy), re-introduction of livestock across the land and away from large concentrated feeding operations, and agro-forestry and silvopasture. Every time a farmer implements these new practices, they create more roots in the ground for carbon storage and increased water filtration, and these roots enhance the natural biological cycle in the soil. So not only is the farm drawing down significant amounts of CO2, but it is also effectively reducing methane (grassfed diets yield less methane emissions) and nitrous oxide emissions (from elimination of synthetic nitrogen fertilizers), which are even more harmful than CO2. Furthermore, the global scientific community is saying the farmer’s role in greenhouse gas reduction may give us our only real chance to drawdown emissions back to stable levels. How can farmers transition when they are already losing money? As a young farmer, finding a route to transition to regenerative agriculture within a more conservative family mindset can be tricky. Kitchen table conversations regarding transitioning stalemate quickly unless it can be shown that the new practices provide long-term economic viability to the family farm business. Luckily, innovative farmers all over the country, as well as right here in Nebraska, are already leading the way in the low-cost, low-risk transition to sink more carbon, while increasing profitability on every acre. These farmers are showcasing a direct pathway to a climate-resilient future. That is encouraging for farmers who are contemplating what is next for their multi-generational family farms. This more human approach yields new and increased opportunities for young people to return to the land. If I am not a farmer what can I even do? With one more generation of farmers removed from the land, rural folks have little political representation or food purchasing power. The true power lies in the hand of an intellectual urban food consumer. If we are all truly committed to greenhouse gas drawdown, the consumer must demand a more nutritious, regenerative approach that starts to pay the farmer (and others involved in food production) a fair wage. If the consumer does not demand regenerative products and practices, you can expect a future with less nutritious soil (and therefore less nutritious food), foul air, and increasingly toxic and harder-to-find water resources. The only way to truly protect you and your family is to “Know Your Farmer.” When the relationship between the farmer and the consumer has been reunited our society will again flourish. For starts, information on what farmers and businesses you can be proud to support can be found in RegeNErate Nebraska’s “Regeneration Proclamation.” The 2nd edition comes out in May. Urban farming is also an important part of the regenerative picture, providing more opportunities for large population centers, including lower-income communities, to thrive even in extreme times. Since technology and modification have failed to “feed the world,” we must seek more logical human-based approaches. This means we must better utilize vacated urban lots to grow food, breaking down food access barriers, all the while improving soil health, clean air, and species habitat & diversity within city limits. Graham P. Christensen is a fifth-generation Nebraska family farmer, the President & Founder of GC Resolve, the State Secretary of the Nebraska Farmers Union, and co-founder of RegeNErate Nebraska. Graham farms with his family in rural Burt County, Nebraska.